1. The M4V to MOV converting time is pretty slow, especially when there is a high traffic. 2. 100MB file size limit makes it pretty annoying for MOV video conversion. 3. You can only convert no more than 5 M4V files at the same time. 4. Free users are limited within 50 video conversions per day. 5. Email is required for the converted file. 4) Download YouTube or other online videos to MOV, MP4, etc. 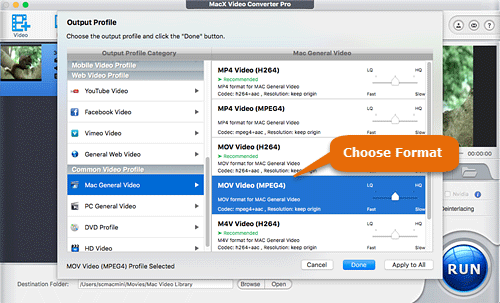 For a limitless M4V to MOV conversion, MacX Video Converter Pro is your nice option. With a Mac-style interface, the M4V to MOV video converter greatly eases the converting process and makes it easy to convert any videos among SD, HD and 4k UHD, e.g. M4V to MP4, WMV to MOV, AVI to MP4, M4V to AVI, MKV to AVI, YouTube to MP3, and more. Thus, all video format conversion troubles are solved and videos in M4V are converted to MOV that is more suitable for playing on iTunes, QuickTime, iPhone, iPad, iPod or editing in iMovie, Final Cut Pro. There is no limitation of the file size of the source video and offers a pretty fast converting speed, due to the support of hardware encoding technology, multi-core CPU and hyper-threading technology. Additionally, with the m4v to MOV converter, you are also allowed to create M4V from MOV videos and other mainstream audio/video formats and make all your videos playable on the mainstream devices, including the latest iPhone, iPad, Android, PSP, HD TV, and more within a click, thanks to its 400+ preset profiles. Step 1: Free download the M4V to MOV converter on Mac computer (macOS high sierra included). 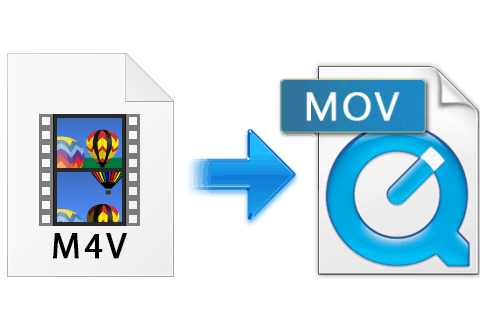 You can also go to the Windows version to convert M4V to MOV on PC computer. Then click the Add Video button after you load the software. You can add more than one M4V files at a time. Step 2: Go to the Mac General Profile -> Choose MOV format. There are over 400 profiles tailored for different media players, game consoles, mobile devices, tablets, TVs, and online video sharing sites. That means you can easily convert M4V to MOV, MP4, iPhone, iPad, PS4, Galaxy S8, etc within one click. Step 3: Click Browse button to choose the output folder you'd like to convert M4V video to. Step 4: Press RUN to begin converting M4V to MOV format. It won't take a lot of time for the MOV encoding. The M4V to MOV converter is generally for M4V videos that are not protected. It's quite the same to convert MOV to M4V. Note: For people who used to download movies or TV shows from iTunes store, these contents might be copy protected with DRM that prevents you against any piracy. So you have to turn to some DRM removal software like MacX MediaTrans to remove DRM from iTunes movie and then freely convert M4V to iPhone iPad friendly format like MP4. This tool is meant to be used only with your DRM contents you own for fair use only. No redistribution or commercial use is not recommended. MacX Video Converter Pro is a top-rated video converter that can convert videos from M4V to/from MOV, MP4, WMV, AVI, MKV, etc for macOS and Windows. It can also download YouTube or other online videos and make them playable on Mac QuickTime, VLC, iPhone, iPad, etc on the go. No size limits, no ads, no extra software.